Designed to cater to a multitude of lifestyles and homeowner needs, the Breckenridge offers exceptional space utilization, an open kitchen, spacious dining area, three bedrooms and two bathrooms. A gable rear door provides for an optional or site-built, attached garage. 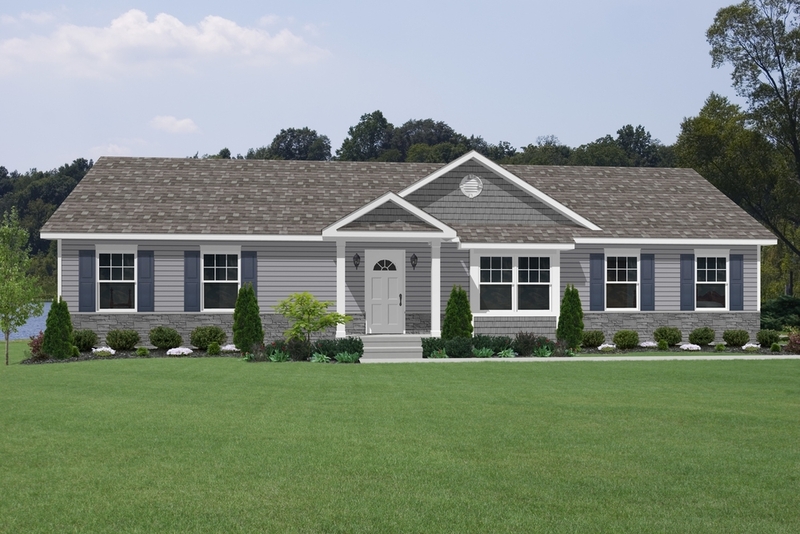 The Breckenridge is available in three standard sizes, ranging from 1,500-1,600 square feet of living space with further customization and siding available. 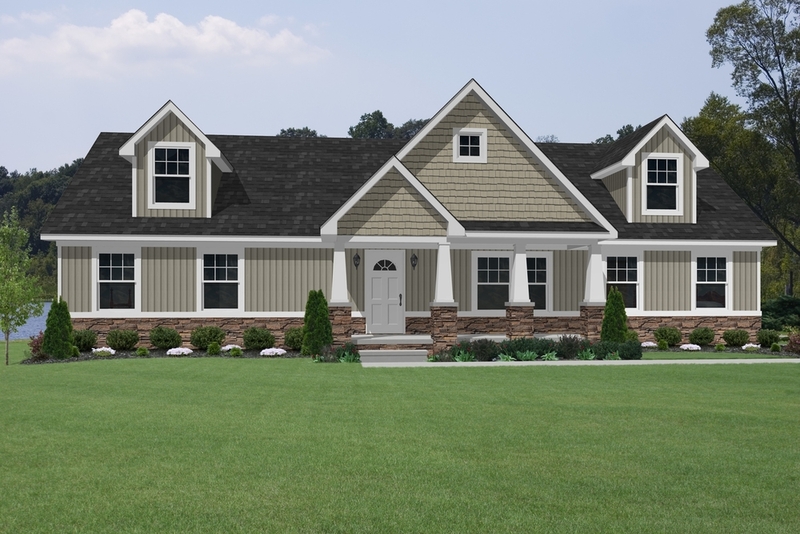 The Breckenridge is available with a number of facing elevations. Shown below are a couple of suggested options. As always, renderings depict optional items and items that are provided and installed on-site by the builder or home buyer. The Breckenridge with standard 5-12 pitch truss with 27.5 ft. saddle porch, and half colonial windows. The Breckenridge with opt 7-12 pitch truss, 24' turned gable dormer, box bay window, half colonial windows, site built porch. The Breckenridge with opt 9-12 pitch truss, (2) 7' doghouse dormers, vertical siding, half colonial windows, site built porch. 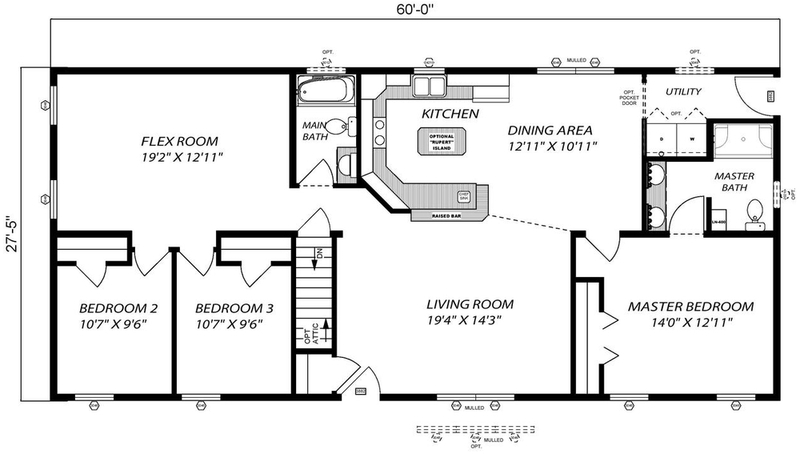 Square Footage: 1,645 sq. ft. This home features a specifically-designated flexible space that is intended to be custom chosen. This space can be made into a fourth/guest bedroom, a family room, sunroom, library, home office, or virtually any other space desired.